As we all know, with weather in the UK being so very reliable (particularly during the summer months) brides can confidently opt for an outdoor wedding safe in the knowledge that the weather won’t spoil their big day. So the main question to consider is: should you choose a marquee or a ti-pi (or if you prefer, tee-pee) in which to hold your wedding? Both have their advantages and similarities. Both options are weather-proof. 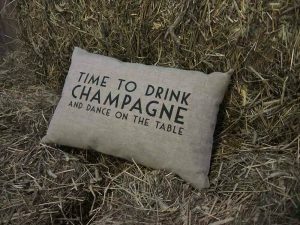 We were talking to one wedding marquee company owner recently who told us that he only begins to become concerned once the winds reach 50mph, at which point he adds additional guy-lines. So on all but a handful of days each year, the structures themselves should be absolutely fine. The materials used are also very robust and weather-proof, and we are yet to encounter any “leaky” marquees or tipis at any of the weddings we have attended. Wedding venues will often have a permanent marquee within the grounds where much (or all) of the wedding day takes place and these are equipped with heating so even the cold won’t matter. We have served crêpes at many winter weddings held in marquees and have never encountered any issues at all. 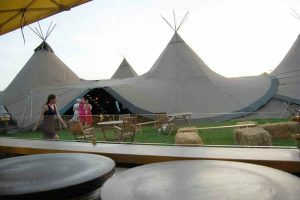 Tipis (usually being temporarily erected) generally have portable heating which are very effective and as the structures are temporary, all services within them have to be mobile – eg bar, dance floor etc. So if you are planning on having crepes at your wedding, our crêpe station will work equally well in a tipi or marquee. The biggest difference between the two options is the overall feel they generate. Marquees lend themselves to a much more formal, traditional wedding. and are often bright, with white drapery and lots of light. They look and feel very stylish and “classical”. All other things being equal, my personal preference would be for the tipi option. I would favour striving towards creating the unique and memorable feeling that I believe all weddings should aspire to achieve. The tipi weddings we have attended over the years have always been memorable and there is something unique about walking into a shadowy, orangey tent type thing, wearing a wedding suit.